LIGHT. PRECISION. ANALYTICS. LTB Lasertechnik Berlin GmbH is an innovative developer and manufacturer of short-pulse lasers in the whole optical spectral range, high resolution spectrometers and laser-based analyzers, marketing its products world-wide. We anticipate needs within the widest array of applications and incorporate them into our product development. Our products are characterized by a high innovation level and influence the global device standard. Apart from the high quality and know-how that our customers have come to expect and rely on, our products are economical, practical, mobile and efficient. The repetition rate and lifetime of a laser are key parameters especially with regard to a highly competitive market in the laser sector. Therefore nitrogen laser technology, particularly applied for MALDI-TOF and MALDI Imaging, needs to be reviewed to provide significantly higher repetition rates for increased application requirements. The project RAPTOR is funded by the European Regional Development Fund (EFRE) and aims to carry out fundamental research on high repetitive UV gas lasers. LTB Lasertechnik Berlin GmbH and the department of Physical Chemistry of the University of Potsdam have started the bilateral project called LIBSqORE. The aim of the three-year project is to investigate an innovative classification and quantification of ores using laser-induced plasma spectroscopy (LIBS). This project is co-financed by the European Regional Development Fund (EFRE). LTB Lasertechnik Berlin is member of the Competence Network for Optical Technologies Berlin-Brandenburg. 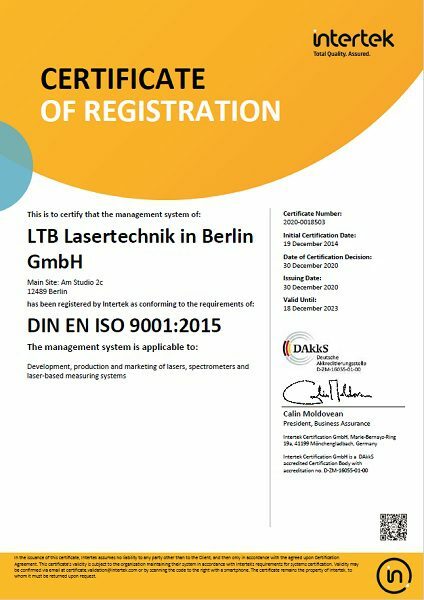 LTB Lasertechnik Berlin GmbH is certified according to DIN EN ISO 9001:2015 . The introduced Quality Management System (QMS) shall ensure that development, production and sales of lasers, spectrometer and laser-based measuring systems meet our high demands for quality and efficiency. We seek a continuous improvement of our internal processes. 1990 Founding of the company as a spin-off of the former Academy of Sciences of the GDR. The founders had already gained more than 10 years of experience in the development and manufacturing of UV short-pulse lasers and dye lasers. Buyback of patents, technical and scientific revision of the product range, sales of the products mainly to universities and scientific institutions, R&D and product innovation are an inherent part of the business activity of LTB.